Do you know how to trade the double bottom chart pattern? Many traders overlook this profitable price action trading pattern because they don’t know how to trade it properly. In this addition to my free price action course, I’m going to show you a few profitable ways to trade the double bottom chart pattern. There are many ways to trade this chart pattern, but in this article, I want to focus on three profitable techniques that I have used to trade the double bottom chart pattern. I’m also going to show you which technique I prefer to use, and why I don’t trade the traditional techniques for this pattern anymore. By the end of this article, you should be able to identify and trade good double bottom chart patterns. After you learn how to properly trade the double bottom, it may become one of your favorite price action chart patterns. 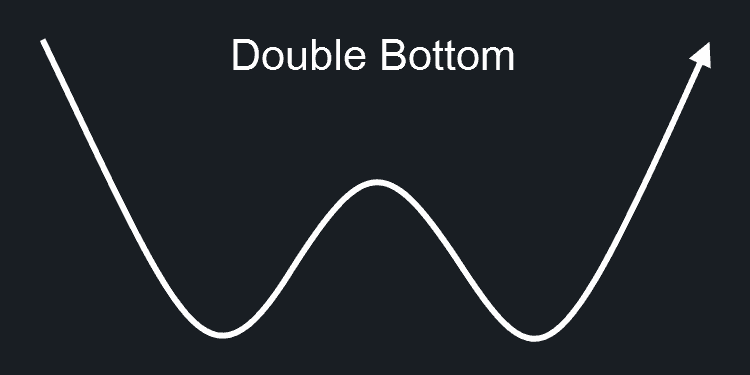 What is a Double Bottom Chart Pattern? A double bottom chart pattern is a strong bullish price action signal that occurs at the end of a downtrend. It happens when an equal, or almost equal, low forms during a downtrend, instead of another lower low. The idea behind the pattern is that failure to make another lower low could be a signal of momentum leaving the trend. The first low in the pattern becomes support that provides a strong bounce for the second, equal low. As you can see from the image above, a second horizontal line is also drawn at the middle peak. This is the traditional breakout point of the double bottom chart pattern. I’m going to refer to this line as the breakout line. 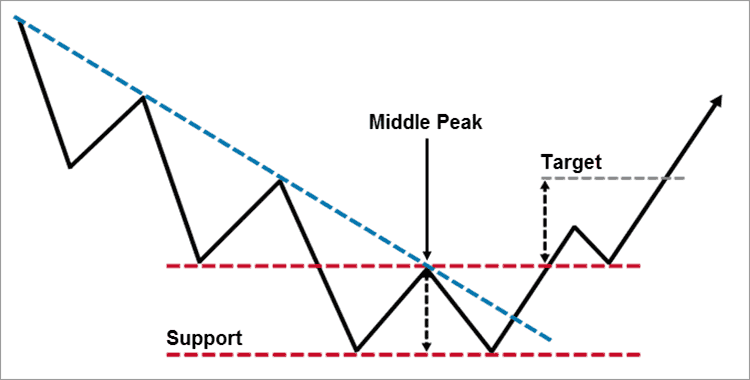 To get your profit target, you measure from the support line to the middle peak (or breakout line). Then you take that measurement and duplicate it upward, starting from the breakout level. Note: There is no ascending or descending version of this pattern, unlike the head and shoulders chart pattern. All of your important levels (other than the main trendline) will be drawn horizontally only. 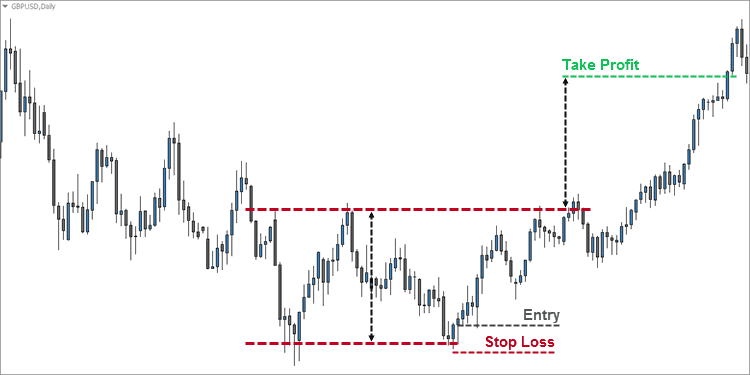 Starting with the standard way to trade the double bottom, your entry is taken after price breaks the breakout line. Most traders opt to wait for a candlestick to close above the breakout line to enter. Your stop loss is placed under the most recent low. Note: As you can see in the example below, waiting for a close above the breakout line would have resulted in a missed opportunity. Often there is a pullback to the breakout line, but in this case, it did not happen. The reason I don’t trade the standard double bottom technique anymore is because the reward to risk ratio is not good enough. Some traders use the traditional take profit target to partially close their position, leaving the remaining position to ride the trend (which can improve the risk to reward). The next technique is more aggressive and provides a better risk to reward scenario. In this technique, you wait for a candlestick to open and close above the trendline. If that happens, you enter at the open of the next candlestick (see the image below). Your stop loss is placed under the most recent low. If you’re going to use this technique, I recommend moving your stop loss to break even before price makes it back up to the breakout line. The breakout line often acts as resistance, so it’s a good idea to move your stop to break even, as long as your trade still has a little room to breath. The reason I haven’t continued to trade this technique is because the reward to risk is still not good enough. The risk to reward scenario is better in this aggressive entry, but the strike rate is also lower because you’re not waiting for the double bottom to be confirmed (with a breakout). This last technique is the way I like to trade the double bottom chart pattern. It is much more aggressive, but the risk to reward scenario is often excellent. In the example below, you could have made over 9 times what you had risked. I start looking for a bullish entry trigger where a double bottom chart pattern may be forming. In the example above, we got a nice bullish engulfing candlestick pattern right on the support line. Your entry would be the standard entry for a bullish engulfing pattern, which is the open of the next candle. Your stop loss would be placed under the most recent low, and your take profit would be the standard take profit target for the double bottom. As you can see, learning how to trade the double bottom chart pattern can be lucrative. However, as I’ve explained, the traditional techniques for trading this chart pattern will not usually give you a great risk to reward scenario. Using my aggressive entry, you can usually get a great risk to reward scenario. The downside is that, for many traders, especially new traders, it’s hard to let a winning trade fun for so long. Most traders would be tempted to close during any one of those pullbacks. This aggressive technique also allows you to move your stop loss to break even before price touches the breakout line, while it still usually provides your trade plenty of breathing room. Make sure you do leave your trade some breathing room, though. The last thing you want is to be right on the trade but only make a pip or two because you moved your stop to break even too early. If you’re using price action signals as your entry trigger, trading MACD divergence can help you qualify and time your entries. If the MACD is making higher lows while price is forming your double bottom, the pattern is usually stronger. If you’re a price action trader, you need to learn how to trade the double bottom chart pattern. Make sure you backtest and demo trade any of these techniques before adding them to your trading plan. Have you had success trading the double bottom pattern? Let me know in the comments below. I also use divergence to try to time a double bottom which can be very rewarding in terms of risk reward, which I have been trading on Daily or 4 Hourly. I’ve been only taking trades upon trendline break as you have shown. I will certainly try the more aggressive option in the future. That’s great! Using divergence with price action patterns is a great way to trade the Forex market. I prefer the aggressive entry, but I’ll still take a trendline break if I don’t get a strong candlestick signal for the aggressive entry. Thanks again for reading and commenting, and for the kind words. Good luck!